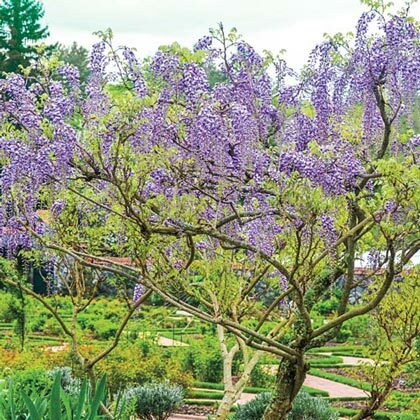 Tree Wisteria | Gurney's Seed & Nursery Co.
Foot-long clusters of delicately hued, fragrant lavender flowers cascade from sweeping branches in summer time. Velvety green seed pods follow. Grows 6-8 ft. tall. Prepruned to tree form (prune regularly or it will revert back). Zones 5-9. Flower Form6 - 8 inch racemes, fragrant. BloomsLate May - Early June. Fruit4 - 6 inch seed pods. Soil RequirementsWell-drained, moist deep soil. pH adaptable. PruningThis is a vine that has been pruned to a tree form. You will need to prune it regularly, or it will revert back to vining form. CommentsCompound leaves have a ferny appearance. Cut back vigorous growth. Use nitrogen fertilizer sparingly. Train to tree form. 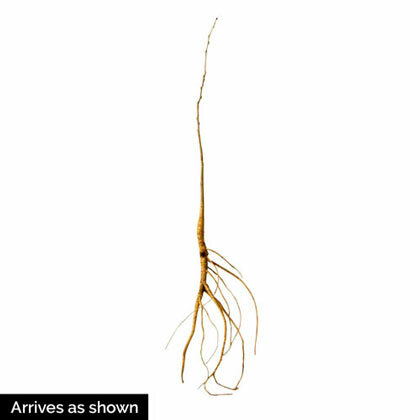 DepthWhere root meets the stem.